This course explores the impact of the Crusades on the Jewish community through the birth of Israel. Students study key personalities and events to gain a deeper appreciation of the period and its lessons for today. Topics include: Ashkenaz and Sefarad, The Ottomon Empire, Lithuania-Poland-Galicia, Enlightenment-Haskalah, Hassidut, Modern Zionism, The Holocaust, The Establishment of the State of Israel. 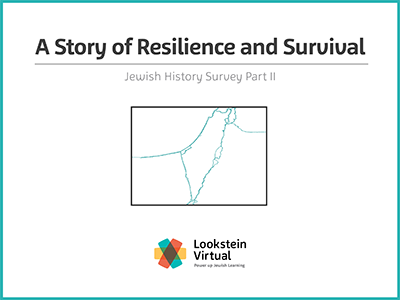 We will follow the explorations of two children as they discover the secrets to Jewish survival and resiliency throughout our unique history.